Materials – the stuff of which everything is made. You might not give much thought to the materials around you: the metal in the door of your car, the plastic used in airplane windows, or the steel from which elevator cables are made. Yet, in each of these cases, the selection of appropriate materials is critical to our safety. Systems that transport and store spent nuclear fuel and other radioactive substances are made of a variety of materials. All of them are reviewed to confirm that those systems can protect the public and environment from the effects of radiation. The NRC does not dictate what materials are used. Rather, the NRC evaluates the choice of materials proposed by applicants that want NRC approval of systems to transport or store radioactive substances. We typically refer to these substances as radioactive materials, but that might make this discussion much too confusing. What makes a material “appropriate” to transport and store radioactive substances depends on a number of factors. First, materials must be adequate for the job. In other words, the mechanical and physical properties of the materials have to meet certain requirements. For example, the steel chosen for a transportation canister has to withstand possible impacts in a transport accident. Neutron-absorber materials need to block the movement of neutrons to control nuclear reactions in spent nuclear fuel. Next, when making complex metal system, parts often are fused together by partially melting, or welding, them in a way that ensures that the joints themselves are adequate for the job. It may not be obvious, but during the welding process, the welder is creating a new material at the joint with its own unique properties. That’s why the NRC looks at how this is done, including the selection of weld filler metals, how heat is controlled to ensure good welds, and the use of examinations and testing to verify that no defects are present. 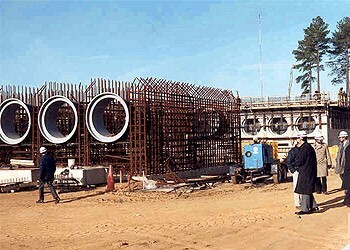 Horizontal storage systems under construction. Finally, the NRC considers how materials degrade over time. In other words, we must take into account a material’s chemical properties – how it reacts with its environment. We’re all familiar with how iron rusts when it gets wet or how old elastic materials (e.g., rubber bands) become brittle. Often such degradation is not important. But sometimes it can cause concern. Thus, materials must be selected based on their present condition and their projected condition throughout their lifetimes. Best practices for appropriately selecting materials and the processes used to join them often can be found in consensus codes and standards. These guidelines are typically developed over many years of experience and through industry-wide and government agreement. But such guidelines may not cover all aspects of material selection. So we also rely on both historical operating experience and the latest materials testing data. The NRC has a team of materials experts that reviews every application we receive for approval of spent fuel storage and transportation systems. These experts must be satisfied that every material and the processes used to join them are up to the job. The materials review is one part of a comprehensive review the NRC does on every application. We will focus on other parts of our reviews in upcoming blog posts. How about promoting your Areva thick TN-24 casks instead? They can be inspected, repaired, maintained and have an early warning detection system, prior to a radiation leak and they are transportable without a separate transport cask? Your thin canister system provides none of these capabilities. Why do you sell inferior products to the U.S., but use the TN series in most of the rest of the world, including France and even at Fukushima? I see Areva sold the TN-24e to Germany. Would you sell these to the U.S. if you had a customer that wanted them? In your own words at the California Coastal Commission meeting you admitted inspecting thin canisters is “not a now thing”. Even if the industry is able to adapt some technology to find cracks and measure depth with canisters filled with spent nuclear fuel it will note be adequate. The best way to find cracks is by putting a fluid dye inside the canister. You require this as part of the factory inspection, but this obviously cannot be done once the canister is loaded with spent fuel. Here is a report that evaluated various technologies for detecting cracks and crack depths. The most reliable one is putting fluid dye inside the canister. 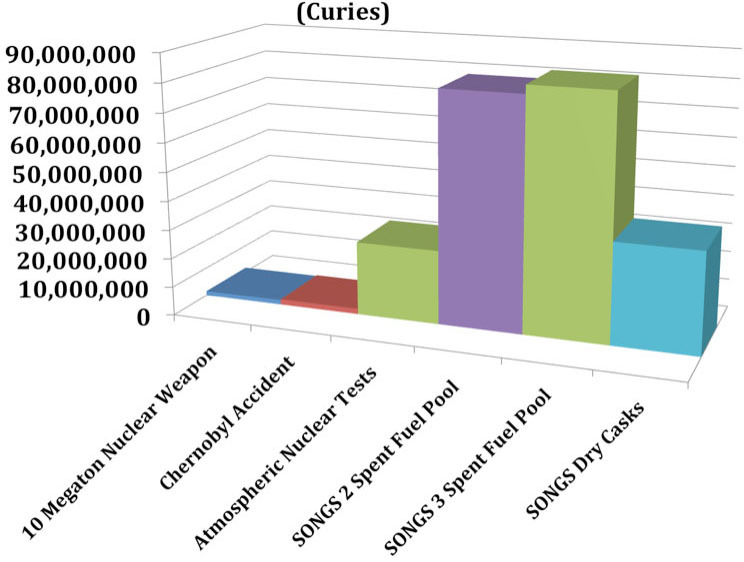 Regarding the amount of Cesium-137, look at this chart comparing the amounts of Cesium-137 at San Onofre compared to Chernobyl and other major radioactive events. San Onofre’s spent fuel contains 89 times the amount of Cesium-137 released from Chernobyl. See this report for details and the above chart. Regarding exactly what will happen with a microscopic or other through-wall crack in these thin (1/2″ to 5/8″ thick) canisters, please provide an answer and a source document for that answer, including one that addresses high burnup fuel and damaged fuel assemblies. Regarding thick concrete overpacks, they have air vents, so a canister through-wall crack will allow radioactive gases to escape. And air vents allow moist air to enter the vents which can trigger the cracking process if salts or other corrosive elements are present (assuming the temperature is low enough for the moisture to stay on the canister, which is the case at Diablo Canyon). This MSDS for zirconium hydrides states: ignition temperature 270° C (580° F). Flammable when wet. Can explode when dry. Contact with water releases explosive hydrogen gas. The question is, how degraded will the zirconium get and how long will this take? Since no canisters with high burnup fuel have been opened and have not been in use that long, all we have are studies such as Billone, showing embrittlement of the cladding from high burnup fuel after dry storage. Why do you continue to ignore data presented by your own staff, such as the Koeberg nuclear plant that had a similar component fail in 17 years with cracks up to 0.61″, located in a similar environment as San Onofre — on-shore winds, high surf, and frequent fog? All the thin canisters are only 0.50″ or 0.625″. 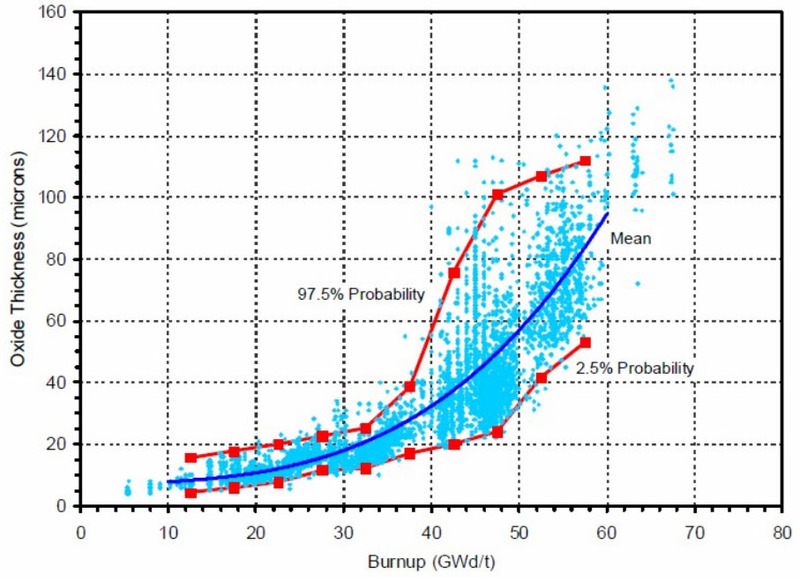 Why do you continue to ignore the EPRI data showing all the conditions for cracking in a 2-year old Diablo Canyon canister? None of the existing canisters have been inspected for cracks. EPRI looked at partial surfaces of a few canisters, but that does not show you microscopic cracks or depth of cracks. 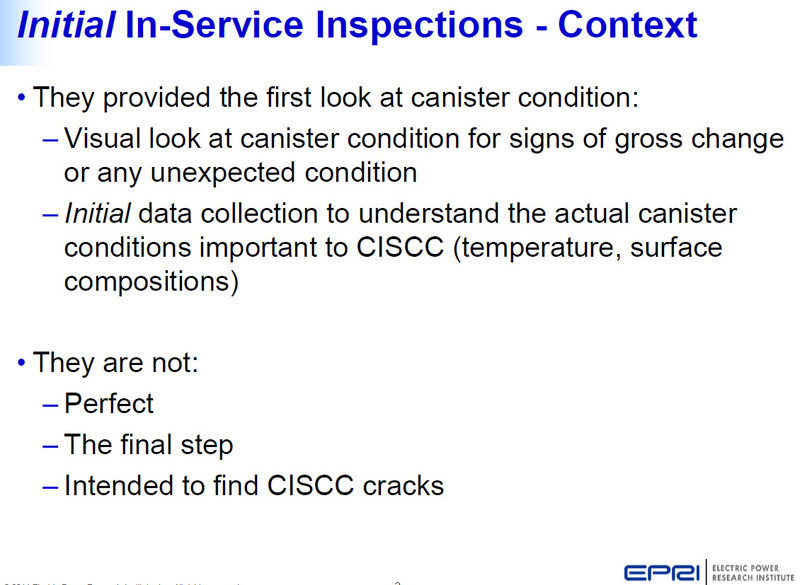 EPRI’s own slide says this “inspection” was not intended to find CISSC (chloride-induced stress corrosion cracks). And when will the NRC begin studying other factors that can cause stress corrosion cracks in stainless steel, such as sulfites? Also, why in your aging management plan (NUREG-1927 Rev 1 draft) why are you allow cracks and only requiring a canister be taken out of service if cracks are 75% through-wall? There is no seismic rating for a cracked canister and cracked canisters cannot be transported. NRC 10 CFR § 71.85 Packaging and Transportation of Radioactive Materials. Preliminary determinations. Before the first use of any packaging for the shipment of licensed material — (a) The certificate holder shall ascertain that there are no cracks, pinholes, uncontrolled voids, or other defects that could significantly reduce the effectiveness of the packaging. 4. Have an early warning monitoring system prior to a radiation release. 5. Have a mitigation plan — require spent fuel pools be retained after they are emptied until the DOE takes the fuel away from the current sites. This is the only method to replace a failing container. You require a canister be removed from service if it has a 75% crack, yet you allow the spent fuel pools to be removing, taking away the only method to comply with NUREG-1927. Where is the logic in that? Also, NRC’s rationale claiming nothing can go wrong when fuel is in dry storage, is not based on current scientific data and needs to be updated. San Onofre has had thin canisters loaded since 2003. Right now we have no idea if any of those canisters are cracking or how deep the cracks are. And the only radiation monitoring you require is for an employee to walk around with a radiation monitor on a stick every three months. Our homes are not insured if something goes wrong. I-5 is adjacent to San Onofre. Closing I-5 would be an economic disaster to California and the country. Don’t tell me the industry will figure out the problems. We have leaking tanks at Hanford; WIPP is shut down from leaks. Savannah River has leaks. These thin canisters have not been used long enough to start leaking, but they will be reaching that age soon and the waste stored in these is much more dangerous, as you know. It’s time for you to do the right thing before it’s too late. You need to raise NRC minimum standards. The Chernobyl event involved an explosion and fire inside an operating reactor with a fully loaded core that spread much of the contents into the surrounding environment. Each dry cask holds a few dozen assemblies of the type used at San Onofre—nowhere near the amount of radiation or cesium released from Chernobyl. Because they are no longer fueling a reactor, the assemblies in dry storage have far lower heat and pressure than at Chernobyl, and there is no driving force to spread radioactive material like there was at Chernobyl, even if there were a crack in a dry cask. Stainless steel canisters are placed into thick concrete or concrete-and-steel overpacks. The canisters and overpacks work as a system to provide radiation shielding and confinement of radioactive materials. Some of these systems are thicker than all-metal casks. Canister-based systems are different from metal casks, which by themselves provide both shielding and confinement. How the spent fuel is shielded and contained are key parts of our review and will be the subject of future blog posts. Both types of systems must meet our strict requirements before we will approve them. The stainless steel canisters can be repaired or replaced as needed. The industry has successfully demonstrated this many times over with stainless steel reactor components in much harder to reach places. Licensees and the NRC will be alerted to a radiation release because of radiation alarms that are required by our regulations. In nearly 30 years of storing spent fuel in dry casks, this has not occurred. Can you describe what you think might possibly leak out of a used fuel storage container? Are you aware of the helium leak detection systems used? Can you tell us the source of the “stress” that is required before chloride stress corrosion conditions are actually established and cracks begin aggressive propagation? I will agree with you in one area. I’m not a fan of below ground storage systems like the UMAX. I prefer to keep the valuable material above ground within easy control of inspectors. I also like keeping it visible to innovators so they continue to be reminded of its value as an emission free fuel source that could be used to power the world’s energy needs — even if everyone achieves an American standard of living — for hundreds or perhaps thousands of years. Out of sight, out of mind does not work for me. You betray your agenda by saying that a few known issues that have developed in reactor containment buildings – all of which are more than 30 years old and still meet integrity tests – prove that the NRC and the thousands of engineers involved in the process of designing, building and certifying reusable fuel storage containers don’t know what they are doing. How much time have you spent in materials science or engineering courses? Do you have any idea of the details procedures that are followed to fabricate and weld materials and the testing that is done to ensure the finished product is satisfactory? Do you understand how we don’t simply trust that everything is fine and we continue to monitor and inspect throughout the service life of the casks? They are simple, rugged devices that hold material with reasonably consistent and predictable properties. They are engineered with wide design margins. The public has been in no danger from reusable fuel storage in the past, it isn’t now and it won’t be in the future. If you don’t worry about the risk you assume from getting up from the couch or sitting at your dining room table, you should not spend any time or brain cycles worrying about used nuclear fuel storage. There are plenty of professionals who have done their job and continue to do their jobs at the vendors, at the NRC, and at the locations where the casks are in use. New Materials Enhance Dry Cask Safety — There have been significant advancements in the materials and technology used to safely store used nuclear fuel here in the U.S., though some of these may not be well-known by the public. As a company that makes these modern storage systems, we’ve been researching durable materials and developing new inspection tools to enhance the long-term safety of these systems. Using duplex stainless steel is an important first line of defense when used in the fabrication of our high-performance double-welded canisters, and forms an additional significant layer of protection when placed inside thick-walled, steel-reinforced concrete horizontal storage modules. This above-ground concrete storage module system meets all shielding, flood and earthquake requirements, and the storage canisters slide out of the module like a drawer, so they are easy to monitor and inspect for long-term maintenance. The horizontal orientation also enables ease of transport away from the site to a consolidated storage facility in the future. Our NRC-approved aging management program features consistent inspections of the used fuel dry storage systems and components to ensure any potential aging effects are identified and effectively managed long before they would ever become a problem. Under NRC oversight, advanced materials and technologies are helping ensure continued safe and secure used fuel management. More information available at: http://us.areva.com/nuhoms, including FAQs about high burn-up or damaged fuel storage and transport, and an annotated illustration of a NUHOMS® used fuel storage facility. Donna Gilmore made a presentation to the NRC about these issues and she also spoke with the Director of Spent Fuel Management. He told her that he sets the minimum standards for dry storage and transport and refuses to increase them. Him saying that he is “hopeful that any problems will be solved by the vendors before it’s too late”, is not good enough for either the people living near all nuclear waste “dumps” or those in the future that will have to deal with any mistakes made in cask selection/regulation by the NRC. Current failed containments at Hanford, Savannah River and WIPP should provide the NRC with the motivation to immediately halt all cask deployments until further investigations are conducted. Approving casks is nothing more than yet another gift to the Nuclear Industry since “cheap” casks offer them a way to comply with nuclear waste storage and do nothing to insure that tax payers with not get stuck with huge cleanup bills in the future. The NRC might think that they are better than the Department of Energy, but I don’t agree, since the NRC has had plenty of regulatory problems. A great example is the RSG debacle at San Onofre, CA, where SCE used the like-for-like “loophole” to self design RSG’s that failed soon after being installed, but received only a white violation from the NRC for something that will cost ratepayers billions of dollars. Now SCE want to spend over a billion to buy “cheap” casks. At the very least, the NRC should require Operators fund a bond in case any problems develop in the future, so that there will be plenty of money to pay for them. Here’s a new video that Jim Heddle produced from the October 6, 2015 California Coastal Commission meeting. In it one of the Commissioners grills Mark Lombard about the inspection, cracking and transport issues. The NRC may not dictate what materials are used, but they can set the minimum standards for storage, transportation and aging management. Currently, the NRC standards are so low they approve 20-year licenses to store thin 1/2″ to 5/8″ stainless steel canisters that are subject to stress corrosion cracks, cannot be inspected for cracks or depth of cracks, cannot be repaired, cannot be transported if they develop any cracks, have no early warning system prior to radiation leaks and no plan in place plan to deal with leaking canisters. In addition, NUREG-1927 (Rev. 1) Aging Management proposes to allow up to 75% cracks in these canisters even though they know canisters cannot be transported with cracks. And there is no seismic rating for cracking canisters. Promises of future solutions are just vaporware — needed capabilities that don’t exist and may never exist. If NRC required products met these needed requirements now, utilities would be forced to choose thick cask technology (9″ to 20″ thick) used in most of the rest of the world. It’s time for the NRC to increase their standards before it’s too late and we have radiation releases all over the country. Each canister contains more radiation (Cesium-137) than released from Chernobyl. The Holtec HI-STORM UMAX system is even worse. It’s an unproven underground system that does not allow for adequate inspection of the below ground concrete portion of the system and will be subject to moisture and chemical degradation from the ground. It’s time for the NRC to take responsibility for setting higher minimum standards that vendors must meet. Approving dry storage systems that cannot adequately be maintained or monitored and accepting vendor promises of future solutions puts us all at risk for both short-term (up to 60 years after reactor lifespan) and long-term. Decommissioning funds are limited. Southern California Edison plans to spend about $1.3 billion (yes, billion) for Aging Management at San Onofre. Once that money is gone, there is no other billion available. The $1.3 billion assumes nothing will go wrong with this inferior technology. Thin canisters have been loading since 2003 at San Onofre. The NRC materials engineers know that these canisters are particularly susceptible to chloride-induced stress corrosion cracking from the marine environment. The NRC engineers say similar components, such as the tank at Koeberg nuclear plan leaked from cracks in 17 years. The largest crack was 0.61″ deep. Most canisters are 0.50″ thick. San Onofre’s are 0.625″ thick. A Diablo Canyon two-year old canister has all the conditions for stress corrosion cracking — low enough temperature for the magnesium chloride salts found to dissolve on the canister, which can initiate stress corrosion cracking. The NRC states once cracks initiate, they can go through the wall of the canister in 16 years. Learn more at SanOnofreSafety.org.